InfoStar provides a a responsive bi-lingual, user friendly chair-side interactive Procedure Explanation program. 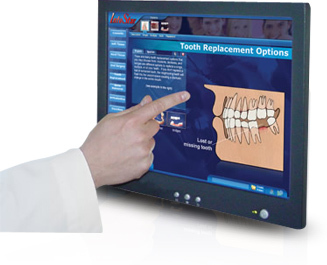 This program was designed to assist a doctor in a quick visual explanation of a procedure and procedure alternatives. The program may reside on an existing PC network or on individual PC computers. This program comes on two CDs that automatically upload to the hard drive. There is an easy to follow tutorial section that explains the program features and user instructions. Call (909) 434-0911 to try this incredible program.The Doctor must call with the request and participate in a brief conversation reguarding his/her expectations.